The company will present at London's gaming event ICE2017 a new and spectacular video slot that breaks with the slot games traditional approach. Red Rake Gaming has designed a game where the reels are not displayed in the traditional vertical way. The music, the atmosphere, the attention to graphic detail, the circular-esque reels presentation, the perfectly well-thought-out features and the emotions conducted by the slot will keep the player expectant and willing to play. The player will find itself immersed in a great adventure in a desert island with a mysterious volcano. 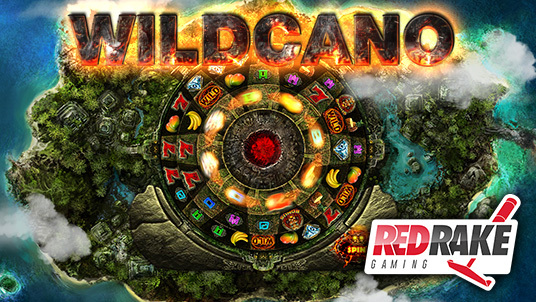 Endless surprises await in every spin to survive and get inside the volcano where the player will face the WILDCANO god to get lots of free spins. Once again Red Rake Gaming, with the making of this innovative video slot, stands out among the gaming sector developers because of its creativity, beautiful design and exciting new features that offer the player a unique and memorable experience.